Julie's Creative Lifestyle: Christmas in July! Today I'm joining Natasha at Keeping the Christmas Spirit Alive 365 for a Christmas in July link party. 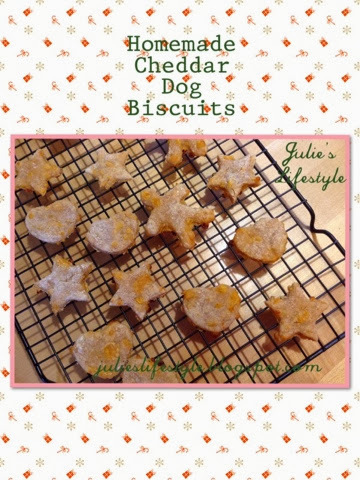 I decided to post this easy recipe to make Homemade Cheddar Dog Biscuits. I made these biscuits and posted it last December and to see that post you can click here. 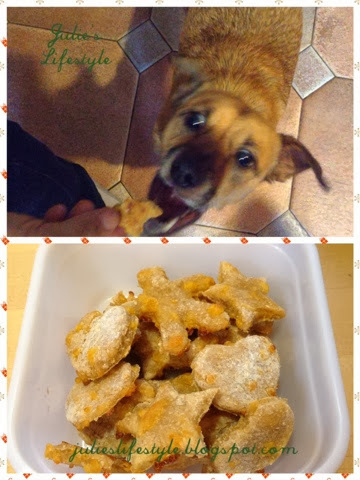 My dog Bosco really loved these biscuits that I made for his Christmas present last year and I would love to share them with you too. Here you can see how much my dog Bosco loves these biscuits! * I found this recipe on Pinterest and the recipe is from The Scrumptious Pumpkin. This makes a great pet gift and the recipe is really easy and simple to make. This recipe can also be made anytime of year for your dog. I do hope I have inspired you to make these homemade treats for your dog this year for Christmas! Thanks Natasha for this fun Christmas in July link party! We used to always give our dog a Christmas present too. :) Tweeted it for you. Have a great weekend! What fun! And I even have doggie bone cookie cutters. Great recipe. :-) Thanks. I must be hungry because the recipe sounds so tasty! Bosco looks likes a very happy dog. 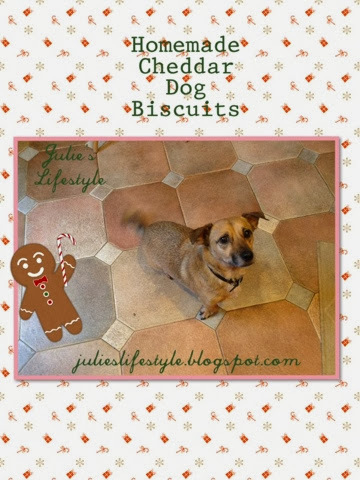 Perfect for gifts for pet owners for the Holidays, Julie!! Bosco is sooo cute. I am going to have to make some of these for our dog. He loves cheese, so these should give him the taste but be healthier. Thanks for sharing. at Count Down For Christmas! I'll be putting the link up every Tuesday. Please link any old/new Christmas post. Skies the limit. I am finding lots of different things to post about! I'll check out the other linky too! Thanks for following! I'll follow you back. I'll have to share this recipe with my youngest son and DIL, for their dog, Layla. Hope you enjoyed your vacation, Julie! They are too cute! What a fun treat for our little furry friends for Christmas! I have pinned this to the Say G'Day Saturday board AND my Christmas board! Thanks so much for joining the Say G'day Saturday linky party. HaHa Julie! I'm loving that picture of Bosco. He loves them! Thanks for sharing your recipe. I don't have pets, but I will pass them on to my friends. Your dog looks very excited about the treats you made! If I had a dog than I would definitely make him some of these yummy treats :) Have a wonderful Sunday, my friend! Hugs to you! I love that you included your furry friend in Christmas in July! Thanks for sharing. Hello from Say G'Day Saturday. I will have to try these with my pups! they love treats and are so spoiled! © Julie's Creative Lifestyle: Christmas in July!